- Publisher This is one of those rare books you can open up anywhere and find a pearl of wisdom. This practical guide to the Ten Commandments shows you how to relate the Commandments to every significant issue---the visual arts, revolution, abortion, suicide, artificial insemination, social injustice, and more. Clear, down to earth, and based on solid scholarship, this volume will enrich and challenge your understanding of Christian living. 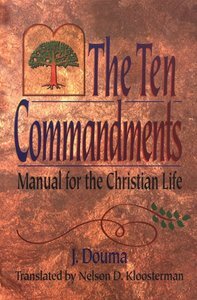 - Publisher :This insightful exposition of the Ten Commandments demonstrates the wisdom of God's Word for the pressing issues of our day. This is one of those rare books you can open up anywhere and find a pearl of wisdom. This practical guide to the Ten Commandments shows you how to relate the Commandments to every significant issue---the visual arts, revolution, abortion, suicide, artificial insemination, social injustice, and more. Clear, down to earth, and based on solid scholarship, this volume will enrich and challenge your understanding of Christian living. :This insightful exposition of the Ten Commandments demonstrates the wisdom of God's Word for the pressing issues of our day.